Sketch a diagram showing how radio waves travel locally and around the world. Explain how the radio stations WWV and WWVH can be used to help determine what you can expect to hear when you listen to a shortwave radio. Explain the difference between a distant (DX) and a local station. Discuss what the Federal Communications Commission (FCC) does and how it is different from the International Telecommunication Union. Draw a chart of the electromagnetic spectrum covering 300 kilohertz (kHz) to 3000 megahertz (MHz). Locate on your chart at least eight radio services, such as AM and FM commercial broadcast, citizens band (CB), television, amateur radio (at least four amateur radio bands), and public service (police and fire). 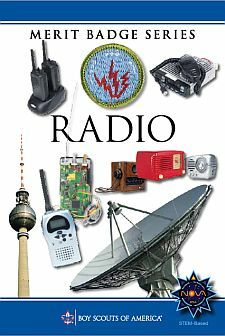 Visit a radio installation (an amateur radio station, broadcast station, or public service communications center, for example) approved in advance by your counselor. Discuss what types of equipment you saw in use, how it was used, what types of licenses are required to operate and maintain the equipment, and the purpose of the station. Tell why the FCC has an amateur radio service. Describe activities that amateur radio operators can do on the air, once they have earned an amateur radio license. Explain at least five Q signals or amateur radio terms. Explain how you would make an emergency call on voice or Morse code. Explain the differences between handheld transceivers and home "base" transceivers. Explain the uses of mobile amateur radio transceivers and amateur radio repeaters. Prepare a program schedule for radio station "KBSA" of exactly onehalf hour, including music, news, commercials, and proper station identification. Record your program on audiotape or in a digital audio format, using proper techniques. Listen to and properly log 15 broadcast stations. Determine the program format and target audience for five of these stations. Explain to your counselor at least eight terms used in commercial broadcasting, such as segue, cut, fade, continuity, remote, Emergency Alert System, network, cue, dead air, PSA, and playlist. Listen across several shortwave bands for four one-hour periods - at least one period during daylight hours and at least one period at night. Log the stations properly and locate them geographically on a map, globe, or web-based mapping service. Compare your daytime and nighttime shortwave logs; note the frequencies on which your selected stations were loudest during each session. Explain differences in the signal strength from one period to the next. Show on a map how you located the "fox" using your receiver.